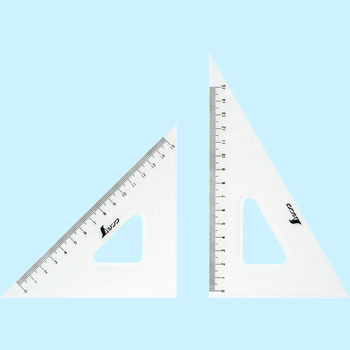 I was looking for a thick triangular ruler. Since there was no handling at other companies, order here. It seems to be firm and durable. This review is about item#68543535. Attach other square material to one side and use it for right angle cutting of styrene paper. You can use it without any problem. I was more pleased if the thickness was a bit more (2.5 - 3 mm). This review is about item#68543553. We use it to correct the drawing at the site, we are thinking as consumable to some extent at our company so we are satisfied with the price is cheap.